view another article... This foot condition is the new back pain — it’s everywhereCarestream, CurveBeam to spread word about weight-bearing CTNew Cartiva ImplantPain Free Plantar FasciitisUFAI featured on ABC NewsCarolina Panthers Star Lotulelei's Foot InjuryFoot Surgery InnovationsBiggest Opportunities for Foot SurgeonsDoctors TV Show - Foot Surgery while Pregnant10 Diseases Your Feet Can Reveal, Readers DigestPlantar Fasciitis TreatmentsThe Doctors TV, Living with Plantar FaciatiisHow to Stop Foot Pain for Good44 Ways to Correct Hallux ValgusDo fat-soled running shoes protect aging joints?Ankle replacement can restore mobilityCam Newton's Ankle InjuryMinimally invasive Foot & Ankle Surgery49ers' Crabtree 'amazing' Achilles recoveryAbout Kobe Bryant's Knee InjuryCurry more likely to play than Bryant3-D Scan Reveals Foot Damage by High HeelsWill Kobe Return? Doctors Raise Questions About Laker Star's Future In The NBAWhat Kobe must do to prove 'doubters' wrongKobe Bryant's difficult task ahead after injuryPau Gasol's return from foot injuryIs barefoot running a bad fad, or better choice?Born to Run Barefoot?Born to run barefoot? Some end up getting injuredCan a $15 basketball shoe have game? Albert Pujols may not play again this season due to a partially torn plantar fascia, but it would be silly to worry that this could be a career-ending injury or that it will significantly debilitate him going forward. 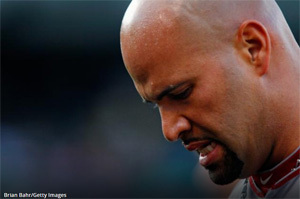 Pujols has been dealing with plantar fasciitis, a painful and lingering condition, for much of his career. Pujols has had regular issues with his feet since 2004. The slugger has needed to have regular treatment to keep the feet functional, and up until he shifted to the Angels, it was usually under control. 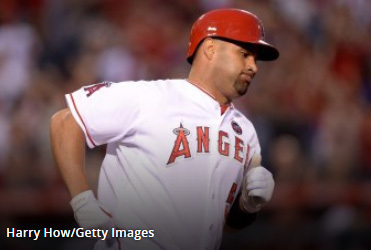 Pujols has evidently torn the fascia, which is why no further surgery will be necessary. Dr. Bob Baravarian, a foot and ankle specialist at St. John's Sports Medicine in Los Angeles, explained to me that this was, in essence, Pujols "doing his own surgery." The fascia tore, releasing the pressure from the inflammation and tightness. While a surgeon could have done this in a more controlled fashion and at a better location, the functional result is the same. Dr. Baravarian thinks this kind of injury takes "about three to six weeks, with six weeks a bit high" to return from. While six weeks may not take us to the end of the Angels' season, at 12 games back already, the Angels don't look to have much reason to rush Pujols back and may have less by the time we get into late August. In baseball, plantar fasciitis derailed and eventually ended Mark McGwire's career, as well as those of several other players, including Marty Cordova. Players like Carlos Ruiz, Evan Longoria and Clayton Kershaw have dealt with milder iterations in recent years. It's more prevalent in basketball due to the pressures on the foot, with Pau Gasol a recent example (very similar tearing to Pujols). Bill Walton counted fasciosis among his many foot issues. That said, Pujols has been very stubborn about staying in the lineup previously. Through elbow issues that lingered for over a decade to knee and foot injuries over the last two seasons, Pujols usually writes his name into the lineup over the objection of the medical staff. Pujols even pushed his way back into the lineup after just 15 days after breaking his arm, partly because he was angered he went on the DL at all for the injury! In that case, the injury was initially expected to cost him four to six weeks. Pujols has used lithotripsy (or extracorporeal shockwave) on occasion, which is the use of sonic waves to break up calcification and adhesions in the surface of the foot. It's a painful therapy that some have compared to being hit on the soles of the feet by a stick. Still, it's hard to look at his numbers from 2005 and beyond and say he was bothered by the feet. If Pujols misses anything more than six weeks, it will be more about the Angels than about Pujols. There is no reason to think that Pujols can not come back from this and get back to his normal level, though it's clear that the level of play he's at now is diminished from previous seasons. Pujols has dealt with a number of injuries throughout his career, which has made me wonder throughout his Hall of Fame-worthy career: What might he have done if he'd been healthy? This latest episode is the first to take him out for an extended period of time, a durability which lends further credence to his greatness.